All we are is cosmic dust in the wind. When dying red giant stars throw off material, dust particles form; those particles are later destroyed by supernova blast waves, which move through space at more than 6,000 miles per second, according to NASA. 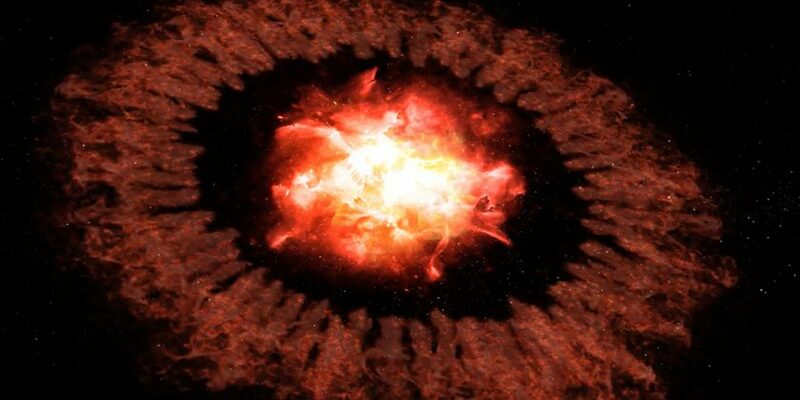 Supernova explosions are among the most powerful events in the universe and can produce a brightness equivalent to the light from billions of individual stars, NASA reports, adding that the blast wave from these explosions will destroy almost everything in its path. Observations from SOFIA — a Boeing747SP jetliner that’s been modified to carry a 106-inch diameter telescope — tell a more mysterious story and show more than 10 times the dust expected. The new study is based on scientific observations of Supernova 1987A, which was one of the brightest supernovae seen in 400 years when it was found more than 30 years ago. It also has a distinctive set of rings that are part of a cavity formed in an earlier, pre-explosion phase of the star’s evolution. The research was published in a recent issue of Monthly Notices of the Royal Astronomical Society. According to the government space agency, dust particles might be forming in the blast wave’s wake, which gives astronomers new insights into how dust moves through space. That dust could either be from the growth of existing particles or from now dust being formed, the space agency says. NASA plans for future observations of the cosmic dust using its James Webb Space Telescope.